Oh boy did I have a nice run today. I woke up, ate some oatmeal, drank some chocolate protein drink and chia, and headed out the door. It was around 68 F this morning and it stayed that way for an hour, then got increasingly hotter. I started out running with Dave. He got new shoes. He has went through three pairs of shoes since we have started running. I have hinted for him to take them off, but I don't want to be pushy. I'll just let him figure it out on his own. Anyway, Dave and I ran a 5K. Toward the end my Dad was there. He was running in his VFFs. I finished running with Dave and met up with my Dad. I ran next to him, tried to give him some tips, such as upping cadence and bending his knees more. Essentially, run like you are riding a tricycle with a very small wheel. I tried something new today. My cadence is probably around 180 steps per minute. I think I sped it up to 200. I felt much lighter. My legs didn't feel worked because I wasn't doing much! I ran really light and it felt awesome. I am definitely going to do this more and see if it reduces wear on my feet. From what I have seen, it has! Despite my AWESOME new run technique, I had two major setbacks today. I have encountered hip flexor problems. Its my left hip. I think it is due to the increased lifting. I have stretched it some and plan to rest. I will probably try to run tomorrow. I'm just glad it's muscle and not joint. After coming home and doing homework I went over to my grandmothers house. 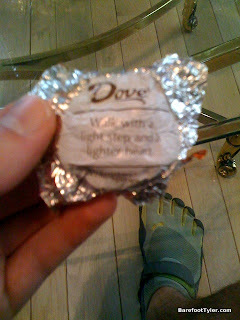 Being the fatty I am, I ate some Dove chocolate. It told me to "Walk with a light step and a lighter heart." A testament to barefoot running? I THINK IT IS! I think I need a new goal. My last 5K was my goal, and now it is over. I really want to do more trail running and shoot for an ultra. Maybe I will set a long term goal for a trail ultra.